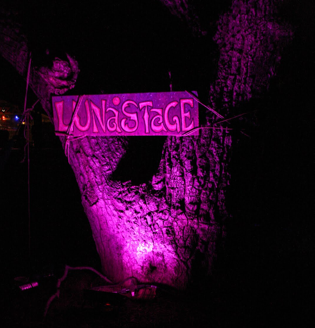 Music enthusiasts, self-proclaimed freaks and free spirits alike gathered Halloween weekend in the secluded wilderness of Live Oak Camp to enjoy the insanity of the Lunacy Music and Art Festival. By day, most campers slept in their tents, waiting for the heat of the October sun’s rays to fade before coming out. Some of the attendees were still quite active, though, as they socialized within the “sacred space” of a 50-square-foot yoga mat and performed acrobatic feats of balance with incredible finesse. Still fewer attendees loitered around a Yoko tea hut and around booths where vendors sold everything from handcrafted, wire-wrapped jewelry to organic, vegan cuisine. By night, however, bass pounded throughout the park grounds as the music stylings of Eoto, Chris B. Ill-esha, Dehli 2 Dublin, Russ Liquid, Nasty Nasty and Akara, among others, blasted out into the audience. The festival was divided into two stages, the Lunar and the Synaptic, with the latter being undoubtedly the more popular of the two. Vibrant and colorful light shows illuminated the crown-like rods jutting out above the stage, and also put a young man wearing an astronaut suit in the limelight as he weaved in and out of the mass of dancers. To the left of the stage, practiced poi manipulators gathered into what became an impressive collective display. Swinging their glowing poi in spectacular patterns, they were joined by masters of finger light shows and glow-in-the-dark hula-hoop wielders. To the right of the stage, partiers reclaimed their inner children by swinging playfully off a huge metal jungle gym. Not too far away, the Lunar Stage was less populated but still boasted an impressive bass and light show. The stage was bathed in green and blue spots of light that shone on the ground and gave the effective impression of an alien landscape. Nearby, there stood a wall of light in a half-circle, 200 or so feet long, that responded to the ambient music with shifting color and different light intensities. The festival was not without its more primitive artistic elements, however. Many artists seemed to draw inspiration from the crowds as they calmly brushed strokes onto their psychedelic canvases in the midst of the activities. With art for sale at booths as well as right by the stage, many people couldn’t help but stop to compliment the artists and admire their merchandise. Clay Smith, a 29-year-old Santa Barbara native, was one of the admirers. When asked what he thought of the festival, he shouted above the music to make himself heard before diving back into the crowd. “It’s the [expletive]! I go crazy for it!,” he said. Other attendees liberally exchanged smiles, smokes and libations as the mood progressed from a sleepy aura earlier in the day to one of enthusiastic community and welcome. Indeed, where else could such happy pandemonium be found? With regard to that, Smith offered one last paradoxical warning before finally disappearing for good into the festivities.